Since Obama (I've decided to go along with a practice I've heard others suggest, to NOT call him "President" and frankly, it's an image that doesn't compute in my mind anyway) never ever impressed me for even one second, while all around me people were tearfully prostrating themselves before his image as "the new coming", I can't really say that he ever struck me as the least bit "beautiful". But as so MANY people seem so fully drawn in by the "good-looking, well-spoken black man" (a concept that ought to insult every other black man and maybe they're soon enough starting to figure that out), whereas I, in contrast, see him as having proven himself to be the worst president in U.S. history before he even took his oath of office just by virtue of the cabinet he assembled (I mean REALLY, making a MONSANTO man the Secretary of Agriculture, suggesting a tax evader as Secretary of the Treasury? Why didn't he assign a wolf as Secretary of the Henhouse? ), I began to muse over that concept of "he looks so good, so he's got to be wonderful". As I thought, somewhere in the back of my head, I could hear my wise and thoughtful father warning us when we were children, "Don't make the mistake of thinking that the Devil would be scary and ugly. Something scary and ugly you would obviously reject. The Devil is the master of LIES and part of that is that he could assume any pleasing shape he would think would be a temptation to you. The truth is, the Devil would beautiful beyond belief. After all, he was before the fall the highest angel in Heaven, and second in command to God. As his name of Lucifer suggests, the light-filled sight of him would make you fall down on your knees. Also, the Devil does not consider himself to be an enemy to God (that would be impossible, anyway). The Devil is an enemy to JESUS, the Son, whom Satan thought had usurped HIS position in Heaven and whose very existence diminished the purity of the One God. The Devil did not want to be second fiddle to Jesus, so he rebelled. Watch out for those temptations...they will not be obviously repulsive." As a child I used to try to imagine what a beautiful Devil would look like and wondered how I could possibly be saved from him due to that pleasing appearance. I gather from Christian theology that you basically are helpless against the Devil, that you need Jesus's help to feel the contrast between the two and to pull away. But I think what people in our present-day society have pulled away from is that kind of understanding, which they would think of as only being rabidly "Christian" (and therefore "backward') anyway. But I don't think you have to be a Christian in order to understand that concept and I am sure other religions have concepts similar to that, if dressed in the stories of a different mythology with different animating characters illustrating the basic concepts. That which is "evil" or which can really hurt you may not be so obvious, but instead would be so very pleasing, and that is what makes it all so very tough. But gee we are so all appearance-oriented, now. It seems that our society really doesn't care about genuine substance at all; the only thing that matters is how things look, and are they fashionable and cool, and anything else is thrown by the wayside. And the way it seems to be in this society, now, the Devil could even appear hideous and frightening, and THAT would tempt some people. A truly beautiful appearance might not even work any more; that would be considered too "prissy and good". Now I am not saying that Obama is the Devil. After all, I started this piece by saying that he never for a second tempted ME. But for sure he does tempt so very many others and it is those others who need to be warned. Because it is so clear to me that the substance of the man is harmful, yet there are so very many, too many, who wouldn't even begin to consider that, let alone clearly see it. And that is because, to them, he "looks and sounds good" (but LISTEN to what he is saying!). But looking good when one is not exists in which realm, now? The second thing about the Devil that I was recently reminded of was that "you have to invite the Devil in." Now, that is amazing when you think about it; that this ultimate power of evil is nevertheless helplessly blocked from forcing his way into you. Is that really true, and if so, how can that be? I can only think that that comes from the idea that the Devil is not against God, the Father, he is only against Jesus, the Son. 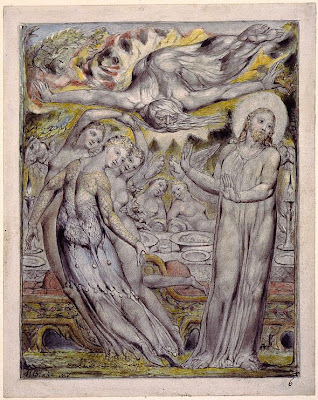 The poet John Milton, in his amazing and powerful work, Paradise Lost, went so far as to say that the main suffering of Satan from the fall is that he is no longer able to look upon God's face. God still holds the upper hand, here, and if people were given the power from God to have freedom of CHOICE, then even the Devil does not have enough power to violate that. So YOU can keep the Devil out, just as Jesus did during his three temptations (and, as Buddha did, during HIS three). 2. You have to invite the Devil in; otherwise, he is powerless against you. For those who don't like that kind of thing, sorry to get all "Christian" on you, but hard times require something strong, and I don't know anything stronger than God (or however you conceive that force). Now might be a good time to reconnect. I agree...connecting to your faith is what will see you through the tough times!